In 1999, as a senior in a public high school abiding within the buckle of the Bible Belt, I attended my local parish’s Catholic-Lutheran celebration of the “Joint Declaration on the Doctrine of Justification.” In the context of common prayer, the clergy signed a copy of this document, in which Catholics and Lutherans articulated “a common understanding of our justification by God’s grace through faith in Christ” (No. 5). One of the theological bugaboos of the Reformation was no longer an insurmountable obstacle to the unity of the church. Recently, the two religious bodies have once again released a highly significant document, “From Conflict to Communion,” this time discussing how Lutherans and Catholics might commonly commemorate the 500th anniversary of the Reformation in 2017. Pope Francis has also announced that he will attend an ecumenical gathering to remember the Reformation in Sweden on Oct. 31, 2016, the anniversary of Martin Luther’s posting of the 95 theses on the door of All Saints’ Church in Wittenberg. To those with even a basic grasp of Reformation history, attendance by a Roman Catholic pope (once depicted in Lutheran Bibles as the Whore of Babylon) at an event connected with the 500th anniversary of Luther’s protest against ecclesiastical corruption is certainly notable. This is not the first unanticipated ecumenical moment in the pope’s recent biography. At the Evangelical Lutheran Church in Rome, a woman asked the pope about the sorrow that she experienced because she could not receive the Eucharist with her Roman Catholic husband. 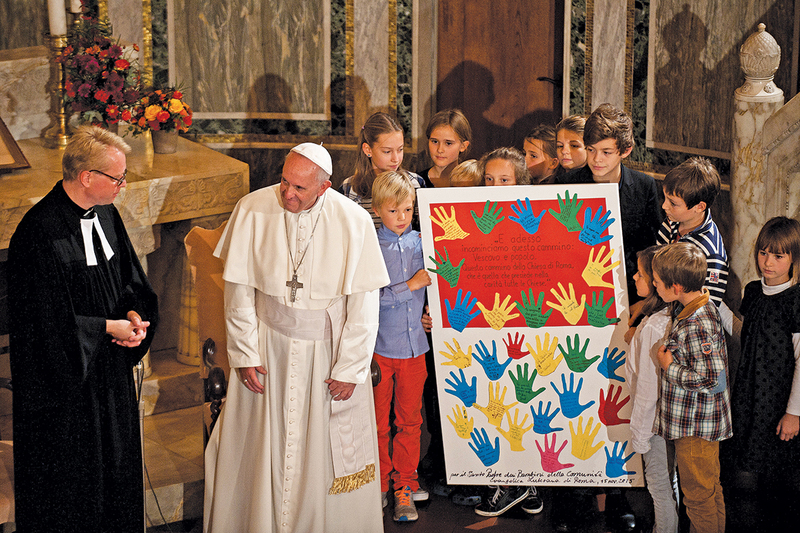 Pope Francis’ response was that of a pastor, observing that among Lutherans and Catholics there is first and foremost a mutual baptismal identity. And between husband and wife there is a sharing in the sacramental life of marriage such that the graces enjoyed by husband and wife alike in their religious traditions overflow into family dynamics. Pope Francis then addressed the question of eucharistic presence, seemingly advising (although careful to note that he had no competence to change doctrine or discipline in this regard) the woman to look into her conscience and determine whether she saw Christ really present in the eucharistic species. From there, the Holy Father said that he would say no more. One of the gifts of Pope Francis’ pastoral interviews is that he is genuinely answering the questions of those before him. But in this case there is a possibility for confusion that requires some theological assessment. Is the pope really saying that there are no restrictions on eucharistic intercommunion as long as one believes in the real presence? Significant ecclesiastical figures, including Cardinal Robert Sarah (the head of the Congregation for Divine Worship and the Discipline of the Sacraments) rejected Pope Francis’ implicit opening for intercommunion among Catholics and Lutherans. The cardinal also stated that among Anglicans (and thus also Lutherans) there is no “real” presence of Christ because priestly orders are null and void after a church is separated from Rome. This argument, quite common among Catholics, is not entirely true. Cardinal Ratzinger argued in a Lutheran-Catholic dialogue that among the Christian churches there is a real yet imperfect koinonia, or communion. This imperfect communion allows for the possibility that ministers ordained outside the Catholic sacramental system can nonetheless celebrate the Eucharist in a way that makes available the salvific presence of the Lord. Validity, as Ratzinger notes, is not the only category for assessing the presence of divine grace. The recent document “From Conflict to Communion” takes up where then-Cardinal Ratzinger left off: seeking what is common in eucharistic understanding among Catholics and Lutherans. The document unambiguously affirms that Martin Luther did not object to the real presence of Christ in the eucharistic celebration but that he denied the church’s understanding about how this transformation took place (No. 141). Rejecting transubstantiation, the Catholic doctrine in which the accidents (or sensory properties) of bread and wine remain but the substance (the what-ness) is transformed into the body and blood of Christ, Luther instead proposed what he considered to be a less philosophical account of how Christ is present “in, with, and under” the specifics of bread and wine” (No. 143). His own doctrine, called consubstantiation, was explained using the metaphor of an iron placed in a fire; the bread remains bread but the presence of Christ has created a sacramental union between bread and body, wine and blood. Lutherans and Catholics have drawn significantly closer to a common understanding of Christ’s presence in the Eucharist since the Reformation. Although Lutherans still do not accept the term transubstantiation, both religious groups can proclaim that “the exalted Lord is present in the Lord’s Supper in the body and blood he gave with his divinity and his humanity through the word of promise in the gifts of bread and wine in the power of the Holy Spirit for reception through the congregation” (No. 154). As Roman Catholic theologians and philosophers reread St. Thomas Aquinas, they continue to discern an account of transubstantiation functioning less as a philosophical justification and more as a guarding of the mystery of a divine presence that is wholly given by Christ. Here the work of Herbert McCabe, O.P., David Power, O.M.I., and Jean-Luc Marion remains invaluable for future dialogues. Of course, Christ’s presence was not the only eucharistic controversy during the Reformation. Luther also protested against what he saw as an inadequate view of eucharistic sacrifice, one in which at every Mass there was a re-doing of Christ’s once and for all sacrifice upon Calvary. The Mass, for Luther, was still a “sacrifice,” but not one in which Christ himself was offered but “the sacrifice of thanksgiving and praise…in that by giving thanks a person acknowledges that he or she is in need of the gift and that his or her situation will change only by receiving the gift” (No. 148). Catholics acknowledge in the document that they lacked the necessary theological vocabulary to respond to Luther’s concern in a sufficient way. Still, Catholics “did not want to abandon the identification of the eucharistic sacrifice with the unique sacrifice of Christ” (No. 151). In the 20th century, through the sacramental and liturgical theology of the Second Vatican Council, Catholics and Lutherans both agreed that if they have a high theology of presence, then “not only the effect of the event on the cross but also the event itself is present in the Lord’s Supper without the meal being a repetition or completion of the cross event” (No. 159). Eucharistic sacrifice is the presence of Christ’s sacrificial love made manifest to the church, and therefore Lutherans acknowledge that it is a genuine participation in the full paschal mystery. While differences remain, “From Conflict to Communion” sees these differences as tolerable disagreements rather than serious impediments to unity. Yet, as Cardinal Sarah noted, the real problem in eucharistic dialogue in the present is the sacramental status of the minister. The document recognizes this, clearly stating, “For Catholics, Lutheran ordinations lack a fullness of sacramental sign” (No. 191). Ordinations take place in Catholicism through apostolic succession: the college of Catholic bishops alone has the power to ordain. Still, as the work of an “ecclesial community,” Lutheran eucharistic liturgies celebrated by those lacking the fullness of the sacramental sign of ordination can nonetheless function as a means of salvation (No. 194). Much work remains to be done relative to ministry, but the document is nonetheless hopeful that if we can agree on justification and eucharistic presence, the question of ministry can be dealt with in time. This reading of “From Conflict to Communion” is not simply a way to avoid asking whether Pope Francis’ implicit allowance for Lutheran Communion in Catholic liturgical contexts (out of a sense of shared understandings of eucharistic presence) is acceptable. Instead, the purpose is first to make clear that Pope Francis is not wrong to say that Catholics and Lutherans share much in common relative to eucharistic faith. There is a mutual vocabulary relative to eucharistic presence and sacrifice that is undeniable. And this shared vocabulary was implicit even in the earliest days of the Reformation, although historical polemics made it impossible for either side to perceive this. The Lutheran tradition develops this shared discourse, and from the perspective of Catholics it has a value that must be acknowledged. This brief survey also requires us to admit that Pope Francis may not have been exact enough in describing the very real differences that still exist among Catholics and Lutherans, especially regarding ministry and thus ecclesiology. A Catholic participation in the Eucharist is never simply a matter of believing in the real presence. It is also a deeper union with the church, which is one: “Those who receive the Eucharist are united more closely to Christ. Through it Christ unites them to all the faithful in one body—the church. Communion renews, strengthens, and deepens this incorporation into the Church” (Catechism of the Catholic Church, No. 1396). Communion implies union with the whole church, and the effects of disunity brought about through the Reformation (an event caused by both Catholics and Protestants) are still among us. The catechism notes that this disunity should be a real source of pain for Christians: “The more painful the experience of the divisions in the Church which break the common participation in the table of the Lord, the more urgent are our prayers to the Lord that the time of complete unity among all who believe in him may return” (No. 1398). In this sense, Catholics should mourn the fact that Lutherans, Anglicans, Methodists and Catholics themselves are not receiving at the eucharistic altar. In light of the serious agreements and disagreements that remain among Catholics and Lutherans relative to intercommunion, if I had been in the position of Pope Francis and had been asked this question, I would have acknowledged the very real sorrow that should be felt that such a couple cannot commune together at the table of the eucharistic Lord. Yet, because of this noncommunion, the couple serves to the entire world as a eucharistic sign of a unity that is not yet here. There is a ministry that this couple offers in their baptized and married priesthood to the churches. We cannot remain complacent in our desire for the totality of unity that would make possible intercommunion. The couple invites the churches to conversion of heart, to see possibilities for communion where seemingly there are none. For as “From Conflict and Communion” describes the present situation: “Lutherans and Catholics are invited to think from the perspective of the unity of Christ’s body and to seek whatever will bring this unity to expression and serve the community of the body of Christ. Through baptism they recognize each other mutually as Christians. This orientation requires a continual conversion of heart” (No. 239). Though we cannot eat the body and blood of the Lord together, we must pray psalms of lament and praise together. We must commune in one another’s homes around meals of fellowship. We must represent to the world in deeds of justice and mutual love the eucharistic consequences of our particular communions, bringing all of humanity into the love of Christ. We must manifest the unity that we do share. Lastly, there should be caution against taking every interview by Pope Francis (or for that matter Pope Paul VI, Pope John Paul II or Pope Benedict XVI) as a development of church doctrine. He was encountering this particular Lutheran woman, who was longing for union with her husband in the eucharistic banquet. He was not providing a catechesis on the Eucharist but expressing sympathy for her longing. It is the work of theologians to understand what is necessary for eucharistic intercommunion. But it is the pastoral requirement of all of us to take seriously the questions asked by our interlocutors. I see a real need for theological clarification in Pope Francis’ response. But I also see a pope who took this woman’s desire seriously, who took her Lutheran faith as an authentic expression of Christian life and who invited her to think about what this desire for Communion might mean. That, to me, is a fine way to start our common commemoration of the Reformation. We all know and believe that Christ said "This is my Body... This is my Blood" When did the church actually ordain it or make it dogmatic that priests or the clergy could actually perform this miracle? I know there was adoration of the eucharist as a symbol during Augustine's time but I do not find where it was believed to be the actual body and blood of Christ at that time. I value direction and assistance in clarifying this with many catholics who like me want to know. THANK YOU. Joe, I hope this can help answer your question. It is clear that the Apostles themselves held that the Holy Eucharist is truly the body and blood of Christ. St. Paul says as much in 1 Corinthians, Chapter 11, that the Holy Eucharist is actual Body and Blood of Christ. For he writes, under the inspiration of the Holy Ghost, "For as often as you shall eat this bread, and drink the chalice, you shall shew the death of the Lord, until he come. Therefore whosoever shall eat this bread or drink the chalice of the Lord unworthily, shall be guilty of the body and of the blood of the Lord....For he that eateth and drinketh unworthily, eateth and drinketh judgment to himself, not discerning the body of the Lord." In other words, he reminds the Corinthians in this chapter that the Mass recalls the death of Christ not as a mere commemoration of the Last Supper but actually as the "unbloody" sacrifice of Christ on Calvary in which the bread and the wine is turned into Christ's body and blood. St. Paul makes this perfectly clear when he says that those who receive Communion unworthily are not merely guilty of profaning a "commemoration" but actually of profaning the actual body and blood of Christ. And he rebukes those who merely consider Holy Communion to be just bread or wine by saying, eat and drink judgment to himself because he fails to "discern," that is, "to comprehend" that the bread and wine is actually the Lord Himself. Thank you for this very important view on our relationship as Catholics with Lutherans, Anglicans ,and , Methodists on our approaches to the Eucharist. As a 84 year old father, and grandfather I believe The Eucharist to be an essential part in our worship. It is who we are as Christians. I am a layman and may have a different view on our relationship with other Christians. Many of the comments take me back to the discussions I was involved with as a younger student. Now I wonder how important these differences are. We are all Christians . We all seek the truth and look to God for daily assistance. Most Christians pay little attention to these differences. We could resolve these differences next year or another 500 years from now and from the pews you will hear "OK' land move on. I am not minimizing the great work those within the church who seek to learn and guide us with these great mysteries. But in this age when we see a great decline in worshipers in all Christian churches. We need to unify. I have a granddaughter and grandson who are members of the Anglican church. When I visit and they are attending their church I will attend and participate in their communion. It is important that I do so. Naturally as a Catholic I will also attend a Catholic service, Playing it safe. Lex orandi, lex credendi. Excommunication has been used since the fourth century as a weapon in theological disputes. Let's share communion first, and then see how the theology of communion develops. Luther was a bad man (to put it no more strongly) who advocated bigamy to please his patron Philip of Hesse, and whose last book, in 1545, was an obscene screed with the title "Against the Papacy, founded by the Devil". In no sense he is the almost saintly figure of modern ecumenism. Much as I admire the HF, his decision to join in this event is already causing confusion - however mistakenly, it is constantly referred to as a celebration of the wretched events it commemorates. Given the theological state of modern Lutheranism, with its acceptance of sexual immorality, does the Successor of Peter really want to get mixed up in this ? The Infinite Compassion of Christ did not lead Him to frequent brothels to find people to find people to have compassion on; why should the Pope attend the spiritual equivalent of one ? We continue to fight old wars and recall previous deprecations against former co-Christians. Jesus is probably not pleased at all. The Protestant Reformation was an effort to correct many serious abuses and sins of the Church over 500 years ago. Since then much has changed, much has improved and been revised. The dialogue between Lutherans and Catholics turns not so much on beliefs but on the nuances of authority and expressions of belief. We are also very close with Anglican & Episcopal congregations as well as Methodist and AME groups. Now it's governance and the role of women that continues to separate us as well as the intransigence of many of the leaders on all sides. Patrick, Joe's question is a historical one. You responded with Scripture. What Scripture says may not be reflected by Church praxis at a given historical time in a particular historical place. In the article this anecdote was told: Pope Francis was asked by a Lutheran woman who attends Mass with her Catholic husband whether she can receive the Eucharist with him. The Pope replied that he had no authority to change doctrine or discipline, but that the woman should look into her conscience and determine whether she saw Christ really present in the Eucharist. In the next paragraph the author says the Pope "is genuinely answering the questions of those before him. But in this case there is a possibility of confusion...". And in the following paragraph he quotes Cardinal Sarah as saying "there is no real presence of Christ because priestly orders are null and void after a church is separated from Rome." I think the author has contributed to the confusion, by converting the original question to the Pope "can a Lutheran receive the Eucharist at Mass" into a completely different question "can a Catholic receive communion in a Lutheran service"? Cardinal Sarah was answering the second question. I agree completely that the Pope's answer to the Lutheran woman was genuine and correct: the primary issue is whether or not she sees the real presence of Christ in the Eucharist. If she has she received the Holy Spirit why would we impede her progress to the Lord by forbidding her to receive the Eucharist? (see Acts 10:47). As the Pope said even if she sees Christ's real presence in the Eucharist there could be secondary issues to consider, e.g. discipline (e.g. the local bishop might have forbidden it) or (to a lay person quite technical) incompletely resolved theological/doctrinal issues between the churches. This article also appeared in print, under the headline "Longing for Communion," in the July 18-25, 2016 issue. Timothy P. O’Malley is director of the Center for Liturgy at the University of Notre Dame in Indiana.